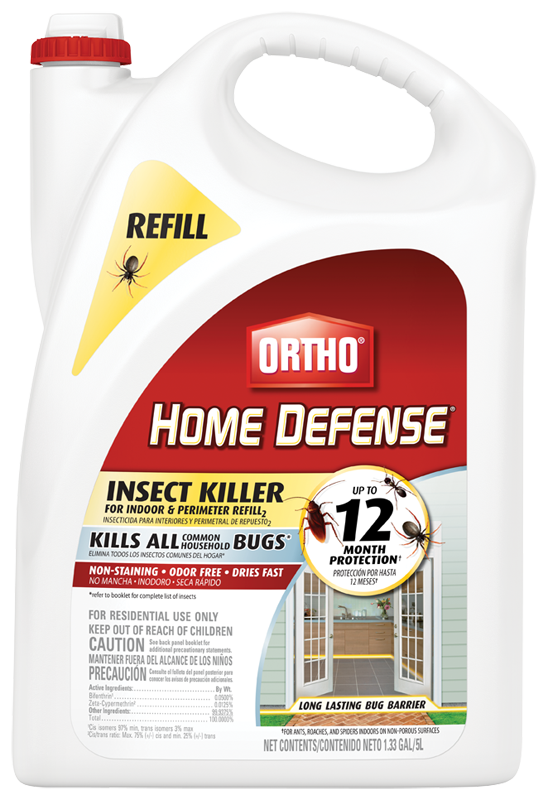 Don't just kill bugs; create a bug barrier with Ortho® Home Defense Insect Killer For Indoor & Perimeter Refill2. Whether you have ants, roaches or other home-invading insects, you can count on Ortho® to keep them out. Use with confidence in bathrooms, kitchens, family rooms, pantries, attics, garages, basements, closets, storage areas, and bedrooms. Apply as a perimeter treatment along foundations. 2. Set spray nozzle to indoor setting. 3. Hold sprayer 12 inches from surfaces being sprayed. 4. Apply a 4 inch band along the interior of your home in areas where insects are a recurring problem. 5. Spray until slightly wet, without soaking. 2. Set spray nozzle to outdoor setting. 4. Apply a 12 inch band along the exterior perimeter of your home in areas where insects are a recurring problem. Do no allow this product to contact water supplies. Do not apply this product in or on electrical equipment due to the possibility of shock hazard. Do not spray into air. Do not spray animals. Do not apply this product, or allow it to drift, to blooming plants if bees are visiting the treatment area. Apply indoor or outdoors according to label instructions. People and pets may re-enter the treated area after spray has dried.